The Northern League, not to be confused with the Northern Premier – or Unibond – League that it feeds into, is often criticised for the lack of ambition amongst their member clubs. 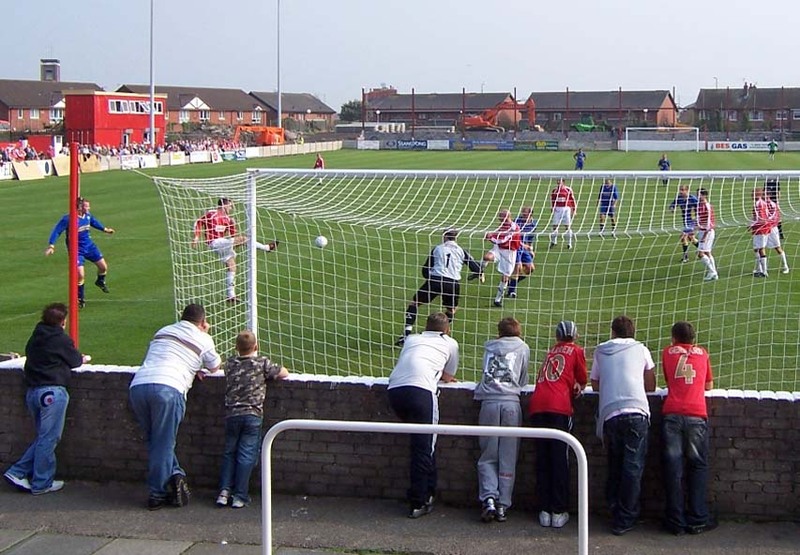 However with concerns over the increased travelling time and cost involved in applying for and accepting promotion to the Unibond’s second tier, Northern league chairman Mike Amos forthrightly retorted to such suggestions in 2004, asking “what’s ambitious about suicide?” During last season too, the Northern League steadfastly stuck in the craw of the FA’s attempts to restructure, with a second geographically divided Unibond Division One unviable for the start of this season due to a lack of clubs both willing and able to make the leap from the far north east. 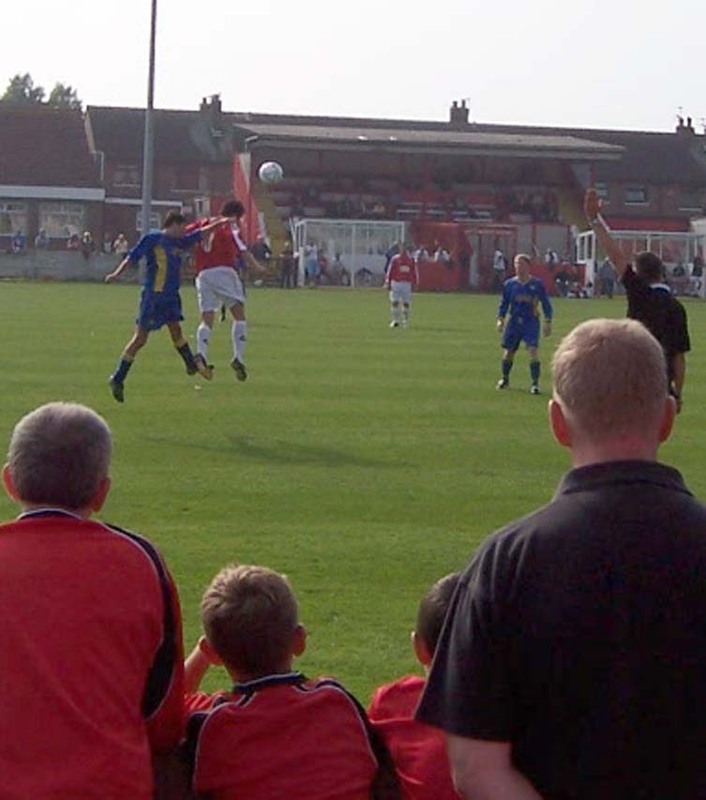 By the end of this season, the situation may well be resolved, with Durham City, Consett and Newcastle Blue Star intimating that they are ready to move onwards and upwards from the second oldest league in the world, despite the prospect of regular journeys all the way to the lower parts of Merseyside and Yorkshire. For those clubs in the extremities, like Northumberland, Devon, Cornwall and to a certain extent Norfolk, this is always going to be a sticking point, and even for the relatively wealthy and motivated, however much restructuring goes on, the problem will remain. Today, I’m in Fleetwood watching their rapid social climbers take on one of the Northern League’s very many star names. Jarrow Roofing Bolden Community Association FC. -- Just breathe that in for a while -- Jarrow Roofing Boldon Community Association FC. Hhhhhmmmmhhhh. Oh yeah! Them Roofers have a tough task on their hands today, having to dispatch with a Fleetwood Town side currently sitting on top of the Unibond’s Premier Division, having raced from reformation in 1997 through the capture of league titles at both levels of the North West Counties League in 1999 and 2005, to which they added a promotion as runners-up from Unibond Div. One last year. Ambition? Fleetwood show them how it’s done, crashing through the leagues like a short-changed ape through a mingy newsagent’s confectionary display. Coming up to Fleetwood today also allows me to visit a chum recently arrived in Blackpool as well as to briefly investigate the unsung parts of the Fylde coast sat in between the two, such as Cleveleys, which is like Eastbourne, only with boredom more vividly etched onto the aging faces. On sidling through Fleetwood itself, past the Fisherman’s Friend factory (a bigger concern than I’d imagined – not that I thought it was just some old, tobacco-addled trawlerman bringing up his grey phlegm and allowing it to harden, but still not as expansive as this) and into a town that feels refreshingly real when compared to the make-up caked ageing showgirl that is its near neighbour. 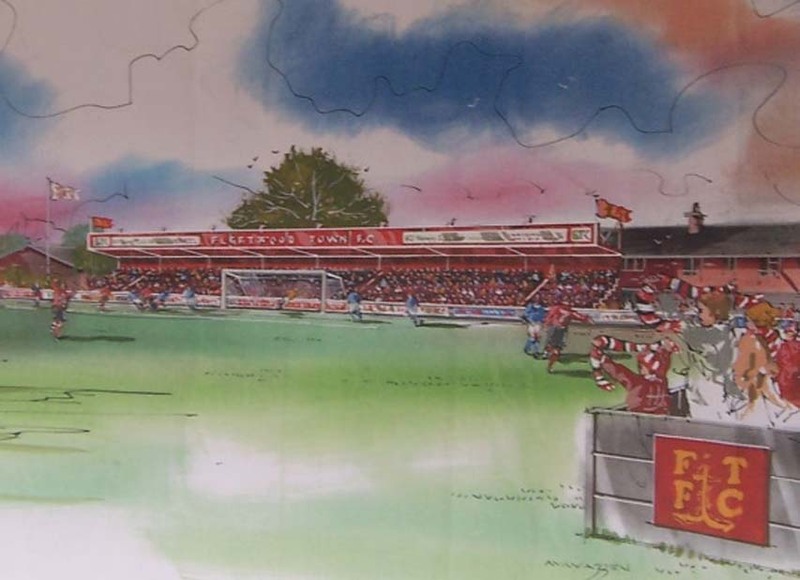 In Highbury, Fleetwood have a ground with a name to make enthusiasts purr, while on the inside, its very bits and bobs, with two stacked terrapins for hospitality, a gleaming clubhouse, a wee stocking filler of a main stand and one end blocked off to allow the building of a new terrace to keep with their water-colour vision [see picture below]. On a mound outside the ground gather a number of young lads either as official ball-retrievers, or entrance fee dodgers (very much the latter as it turns out). “C’mon Fleetwood” shouts one early on as the home side establish their two-tiers-higher credentials, his mate adding “Smack their fookin’ arses” before turning his attention to the lesser officials “Linesman, you’re a wanker. Get a decent job. Be a ref! Or a football player!” This from an eleven year old. Ouch. As early as the tenth minute, Fleetwood make their class count to lead, Richie Allen taking one touch from a beautiful cross-field ball before letting fly with his left foot, the ball travelling at medium pace over the keeper’s palm and into the far corner. It is largely all Fleetwood in the first half, although [inhales] Jarrow Roofing Boldon Community Association see the start of some very good stuff from Keith Hutchinson and Paul Chow down the left flank. By this stage though, Fleetwood keeper Andy Banks is looking like such a pond-side bank-holiday stroller, his glove bag may well contain several slices of stale Hovis Best of Both. In the second half, matters are a lot more even, Jarrow’s Stephen Kennedy making a great save early on, but not long after, at the other end, Hutchinson tests Banks’ crumb-flecked hands. A minute later, he gets to the touch-line again, but his team-mates are left well behind and as such, his pass trickles harmlessly along the unguarded goal-line. One minute before the hour the home support are finally put at ease, Lee Pryers showing great vision to cross the ball from inside his own half, over the defence and straight into the path of ex-Everton man Stuart Barlow, making it simple for him to lash the ball past Kennedy and into the centre of the net. Eleven minutes later, Allen completes his brace and the scoring as a whole, as Fleetwood once more exploit the massive hole being continually left for them on the right wing. Barlow dances through and levels a pass to Allen who first-times a shot between Kennedy and Ibrahim Hassan, the ball striking a desperate, flailing arm on them both as though they are branches only briefly impeding a descent between two trees. As for that hole, well, Jarrow’s defence are keeping their shape but are tucked so tightly together, they appear to all be joined at the hips by a single tube and worked with a handle from the behind the hoardings. Thankfully I can report: there no windmilling. P’raps football ain’t so rotten after all. As Fleetwood step down from 5th gear seemingly to allow Jarrow a consolation, the Roofers use the final few minutes merely to showcase Mark Johnson taking on the role of a 50-year-old-in-someone-elses-testimonial in front of goal, bellowing a number of gilt-edge chances high, wide and hopeless, and that ends up being Jarrow’s lot in this year’s Cup. It’s been an odd kind of cup tie really, I can’t remember the last time I was at a game where a scoreline flattered both sides. 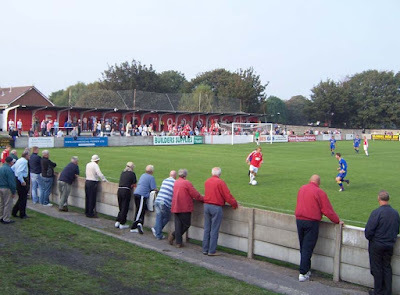 No doubt though that Fleetwood have dealt with the Roofers in a swift and brisk manner, as though having haggled down their fairly honest quote for tiling repair like a retired Army major trying to reignite the fire in his glottis. So game over and thus, of course, I have to head back to the north-west’s iridescent blot on the coastal and cultural landscape. My antipathy towards Blackpool has been documented here before but to be fair, at least the illuminations, which I pass on the blistered-heel dawdle back on the tram, kinda make sense of the place. It may be tiresome town for one like me with all the gaudy an’ that but at this time of year, with levels turned up to an Aphex-Twin-Come-To-Daddy-screaming-in-a-granny’s-face kinda gaudy, the extremities maketh the town. Actually, I forgot to mention, before I made my way back to Blackpool, I did spend a little time in a fairly deserted Fleetwood boozer watching some of the evening’s Prem Plus game and listening in to a conversation amongst a group of late middle-aged folks as they discussed their life experience. “You’ve not lived if you’ve not ‘ad crabs” says one, before his colleague adds “I’ve not ‘ad ‘um. Had thrush though.” The lover of lazy stereotyping in me just wishes I’d found them in Blackpool itself. There aren't many football grounds left that you'd get to by old fashioned tram, that's for sure. I think Fleetwood is where the retired folk of Blackpool move to in their dotage. My Auntie Vera certainly did.